This fixed blade survival knife is perfect for outdoor activities like fishing, hunting or other recreational activities. 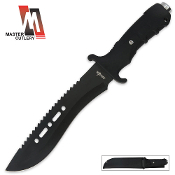 The black stainless steel blade features a sawback spine and the rubberized handle provides a secure grip. Includes a black nylon belt sheath.